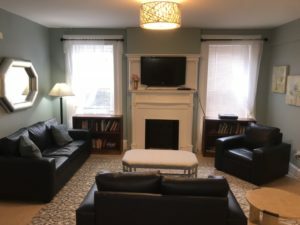 It came to the attention of the League that a communal space at the Center of Hope and Safety in Bergen County, NJ needed some minor renovation and decorating. 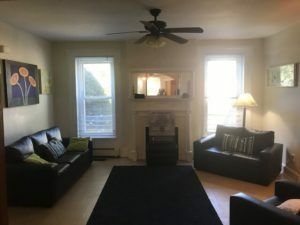 The Center for Hope and Safety is a non-profit agency founded in 1976, dedicated to assisting victims and their children, of domestic violence. Their mission is to provide a range of services to empower women to leave the violence and have new beginnings. During the month of April, the JLBC, through it’s Done-In-A-Day program is renovating and decorating the communal space at the Center for Hope and Safety with the goal of creating a healing peaceful atmosphere in the main living areas of one of the shelters that could be an inviting and comfortable space for women and children who have suffered the traumatic effects of domestic violence…a room that could foster resilience. With the strength and speed of response to adversity and the capacity to recover quickly, the JLBC has committed to fostering more resilient communities. Projects such as these is just one of many ways the League helps to empower and aid women by helping them become more resilient. 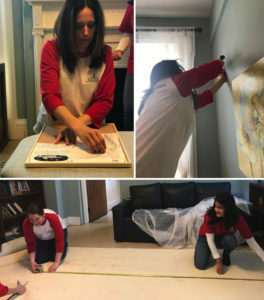 The JLBC partnered with the following businesses: Spectrum Painting, G.Fried Carpet & Design, and Greenbaum Interiors. The first part of the renovation at the shelter began in March with painting the living room, dining area, kitchen and bathroom. 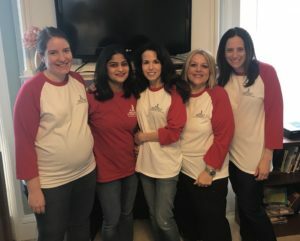 Spectrum Painting based in Pompton Lakes, N.J. generously gave their time and Benjamin Moore paint and supplies to repaint the rooms. The staff and crew of Spectrum Paint were meticulous and efficient and completed everything in just one day. 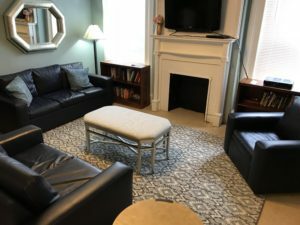 Junior League Done in a Day Committee Chair, Bonnie Shah Dalal and committee member and interior designer Karen Donatelli, selected soothing colors such as wedgewood gray, a serene blend of green blue and gray to compliment the room’s existing navy leather furniture. The adjoining large dining area was painted in pine barrens, a cheerful light and airy green. Changing the colors from the former white gave these rooms a new feeling. G. Fried Carpet & Design, on Route 17S in Paramus generously donated a beautiful high-quality stain resistant carpet which they custom bound into an area rug for the main living area. The rug adds softness and interest in the room. Greenbaum Interiors of Ridgewood and Paterson, NJ. generously provided accessories and furniture including a custom upholstered ottoman and a beautiful silver-leaf mirror to add some sparkle.